Give those Halloween cookie cutters a run for their money by using them to carve pumpkins. You will look like a professional pumpkin carver with the clean lines you will get using cookie cutters to carve your pumpkin. And because there is no knife, it is a kid friendly way to carve pumpkins. 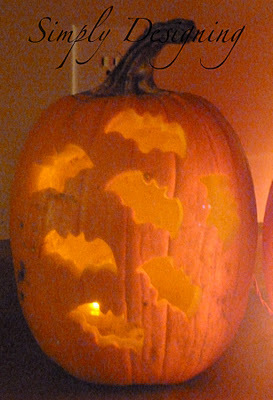 You can see the tutorial on cookie cutter pumpkin carving over at Simply Designing. Hi ;-) The links above take me to a different site other than the Simply Designing. Is there another link I can follow for the pumpkin cookie cutter tutorial? Thank you. Heather, the links have been fixed. Sorry about that. Shansen20, thanks for stepping in and helping! !